This entry was posted in Racing on February 7, 2012 by Steve Tilford. Okay, early season is always hard. I’m not sure what time that is for me anymore since cross season just finished and road season seems to be upon us in a lot of places. It doesn’t feel like early season, but my mind still thinks it is. The first race of the season is always hard. There is always a big question mark hanging over nearly every aspect of your game. That is still the case with me, but not to such extremes. I was racing cross three weeks ago, so I know that I have some type of form hidden away somewhere. 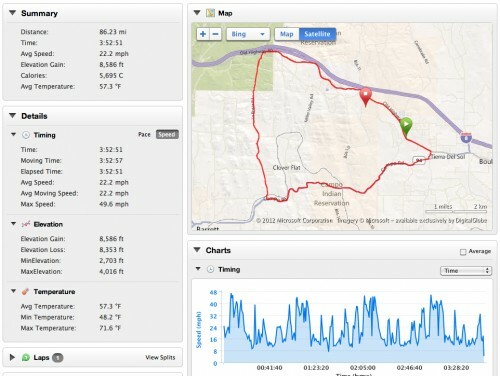 The Boulevard Road Race last Saturday, 60 miles East of San Diego was great. The guys there have an awesome course and everything was run super professionally. The course is 22 miles with nearly half of the course climbing and the other half descending. It is a pretty challenging course. The wind was fairly strong, but from the wrong direction in my opinion, straight headwind climbing and tailwind descending. It was a 4 lap race, putting the distance close to 90 miles. The race went pretty much like I had predicted, but what I had dreaded. 4 guys went up the road pretty early, then a couple more a few miles later and then again some more after that. Eventually when it all settled, there were 9 riders up the road. And the time gap was over 4 minutes. There were probably 80 riders at the start, but there weren’t really any teams with strong enough guys to ride the break down. By the 3rd time up the climb, with one lap to go, there were maybe 30 guys left in the field out of around 80 starters. I decided that I needed to get into a small group that would work together if I had any chance to race for first. I took off towards the end of the climb, but no one came. I rode a few miles off the front, but never really got anywhere. I finally sat up because the descent was way too long for me to try to ride away from a big group. So, the last time up the climb, the speed started increasing. We still couldn’t see the break and weren’t getting any time splits. I jumped a couple times, still hoping to establish a group that would work. Then all of a sudden I could see the follow car ahead with around 6 miles to go. I tried to get away again, but the headwind was really headwind. The official on the motorcycle told me once that we were 40 seconds back. I felt pretty good, but not good enough to shake the remaining 20 guys or so. And everyone seemed content to be racing for 7th, since there were 6 guys left from the original break. With 5 km to go, we were at 50 seconds and I knew it was done. Eric Marcotte, a new rider for the Elbowz/Yamaha team, had been trying to get a good workout most of the day and had been riding at the front. He put in a couple good digs towards the end, but never really went anywhere, probably because, once again the wind direction. The sprint was from way out and a lot of guys exploded because the last km was pretty much uphill. I guess I ended up 6th in the field, because I finished 12th in the end. I felt a lot better than 12th, but when you’re at a race on your own, it is nearly impossible to cover all the moves. I wasn’t riding well enough the first lap to make one of the groups that eventually formed the break, so I was always going to be counting on other riders to ride to be racing for 1st again. And that didn’t really happen. The results are a couple posts below. It was a beautiful course out in the high desert. And super challenging. I am pretty happy how I’m riding so far. I’m flying back to Minneapolis on Thursday to ski for a while before heading down to Texas at the end of the month. I still need to eventually get into a gym and try to alleviate a few nagging problems. That probably won’t happen until March. I am on a weird schedule so far this season. I know this would be way more interesting with power data. Steve, when those 4 guys went early on, how early was it? Were there any teammates in that group, or were they all individual? Did you know any of them? Were you tempted to join the initial 4 when they went, or did you think it wouldn’t stick? What about when the others went and formed the eventual break group and got the 4min lead? Were you counting on the field to chase it down? I am trying to figure out if it’s worth it to jump into an early break for a road race of 60-80miles, if you have desires to do well, especially if you have no teammates. Not so sure a Cat 4 field would get organized enough to chase a break that gets a lead that large. In the lower cat’s, sounds like I should make sure to join an early break. Agree?